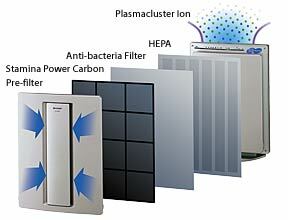 Elma Water Technologies Canada – Sharp Plasmacluster Ion HEPA Air Purifiers and Replacement Filters. Sharp has become the first company in the world to successfully replicate Nature's own air purification process. By creating a positive and negative ion shower (PCI) we are able to recreate the natural chemical process that purifies the air in the Earth's troposphere. In this way, we are able to inactivate most airborne particles, including viruses, bacteria, mould spores, germs, fungi, and other odour causing substances. It is even effective against many of the noxious components contained in cigarette smoke. Sharp's exclusive and highly esteemed Plasmacluster Ion technology introduced a new system to inactivate airborne viruses. Plasmacluster Ions are now becoming accepted throughout the world as an indispensable air treatment system. The key by-product of positive and negative Ions is Hydroxyl, which robs the airborne particles of the hydrogen necessary to survive. Environmental scientists from around the world now recognize the importance of Hydroxyl as nature's air cleansing element. In this way, Sharp's Plasmacluster Ion technology replicates the Earth's natural cleaning system within your personal environment. What is the purification effective against? Multi-layer Filter System Plasmacluster Ion Technology generates a balanced positive and negative Ion shower to purify the air. By Coupling a multi-layer filter system with a HEPA filter, a dual action air purification system is created. Plasmacluster Ionscontrol the ion balance On completion of air purification, Sharp's Plasmacluster Ion technology provides an Ion balance control mode to increase the rate at which negative ions are generated. In contrast to the natural environment in which there are positive and negative Ions in almost the same proportion, the number of negative Ions is decreased in the city. The Ion balance control feature serves to adjust the balance of positive and negative ions to the ideal natural state. The performance of Sharp technology has been validated at 4 internationally recognized research facilities. Sharp was recently presented with the Takagi Award in Japan. This award is given for breakthroughs in science and technology. This is the first time the Takagi Award has been awarded to a consumer products company. 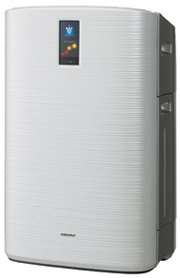 The Sharp FPN40CX system has been awarded the British Allergy Foundation Seal of Approval. 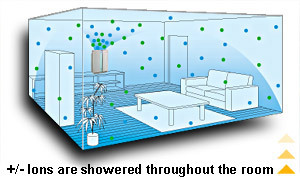 Showers the room with Positive and Negative Ions that seek out and inactivate many airborne contaminants. 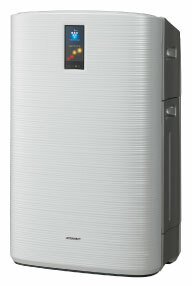 The KCC-150U is the next generation in the Plasmacluster Ion (PCI) Air Purifier family. PCI utilizes both Positive & Negative Ions to	inactivate airborne contaminants and 'Scrub' the air clean. Additionally, it is equipped with 3 distinct Intelligent Sensors (Odour, Dust, Temperature & Humidity) that work in perfect harmony to constantly monitor the environment for unwanted airborne contaminants, and reacts to any changes (when in Auto mode) in order to reduce and/or eliminate them. Unit also comes with full-function remote control. These new Plasmacluster Ion (PCI) Air Purifiers are now a 2 in 1 unit! It now has a Humidifying Feature included similar to the KCC-150U, increasing its ability to inactivate most airborne particles, including viruses,bacteria,mould spores, germs,fungi and other odour causing substances. It is even effective against many of the noxious components contained in cigarette smoke odours.